NCA’s has been designing dynamic learning environments for over 30 years. 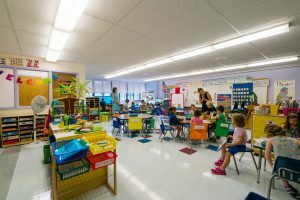 Whether our focus is on private schools, public schools, technical schools, charter schools or higher education, we provide quality work, meet challenging schedules and budgets and respond to our clients’ needs. The newly renovated Kelly Lane Primary School opened on September 6. NCA completed a study based on declining enrollments. The study determined that the Kearns School should close, Kelly Lane School should be transformed to a Pre-K through Grade 2 school, Wells Road School should accommodate Grades 3-5, and the Granby Middle School should accommodate grade six. The Kelly Lane project scope entailed revising upper elementary classrooms into two Pre-School and six Kindergarten classrooms, each with their own child-height toilet rooms. The design process continued through the fall and early winter. With construction professionals on board by mid-February, the project could begin the necessary advanced planning required to target an active work start in mid-June and ensure completion by mid-August. 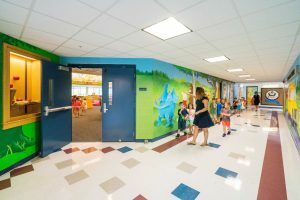 Work proceeded on schedule, and even with a few surprises along the way, the transformed Kelly Lane Primary School opened to rave reviews among parents and children. 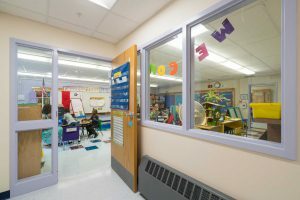 The new Kindergarten classrooms feature pass-through connectors with two toilet rooms shared between two classrooms. These pass-throughs provide flexibility in the assignment of the toilet rooms, teacher interaction and crisis management, and a secondary means to escape an incident in either room. 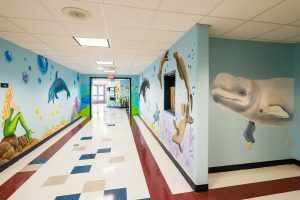 Murals painted by local artist Sheri Fitzpatrick are a delight to the school community. 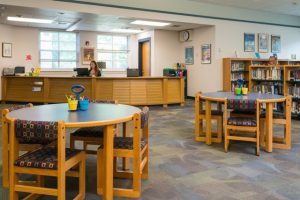 NCA completed Phase 2 of a multi-year transformation of the Library/Media Centers at the Mile Creek Elementary School and the Lyme Consolidated Elementary School. The first phase, completed mostly during the summer of 2015, saw the revision of book stacks, informal reading areas, and directed learning/presentation areas, with a new office/workroom and a small TV Studio at Mile Creek. 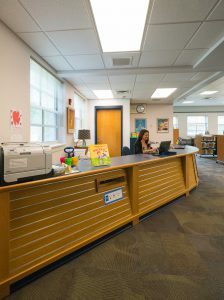 The summer of 2016 brought the transformations to completion with the design and installation of new Library/Media Center circulation desks. The desks feature oak veneer and laminate tops to match adjacent library materials. Slat-wall display panels highlight new or featured reading material.